Want to know the best way to super clean gun parts (and jewelry)? Well the answer is with an ultrasonic cleaner! We’ll walk you through how they work and also how two popular models stack up in a head to head fight. 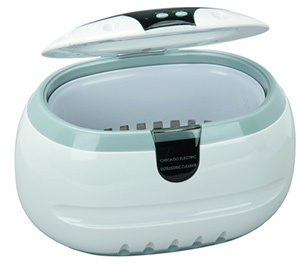 Every ultrasonic cleaner is nothing more than a tub which holds a liquid of some sorts and an ultrasonic transducer. An ultrasonic transducer is the technical term for a device that converts electric energy into ultrasonic waves. In the grand scheme of things, just think of it like a tiny, specialized speaker. When the transducer is activated, it bombards the liquid with a horrible noise that humans can’t hear too well. It sounds like a buzzing to us but to your pets it sounds like Justin Bieber music. This bombardment causes the liquid to undergo a process called “ultrasonic cavitation”. The vibrations from the sound cause small bubbles to form and then pop with a surprisingly incredible amount of force (20,000 lbs per square inch). These rapid and microscopic explosions essentially blast dirt and grime off of surfaces. Even though there’s an incredible amount of force being generated, it’s on such a small scale that it is completely harmless to us and won’t damage the vast majority of surfaces. It should be noted that all my testing was done with either a 1:2 mixture of Windex and water or a 1:2 mixture of Simple Green and water. Plain water shouldn’t be used in ultrasonic cleaners as the surface tension of the water alone makes it near impossible for the microbubbles to form. Having a additive that destroys the surface tension is a necessity. You could use something as simple as dishwasher rinse aid but why not use a soapy liquid to add a bit more cleaning power? Or go with the actual recommended stuff. So that’s how they work, on to the review! In this corner, weighing in at 2.5 pounds, 1 pint of liquid and wearing the white plastic casing is the Harbor Freight Ultrasonic Cleaner ($35)! 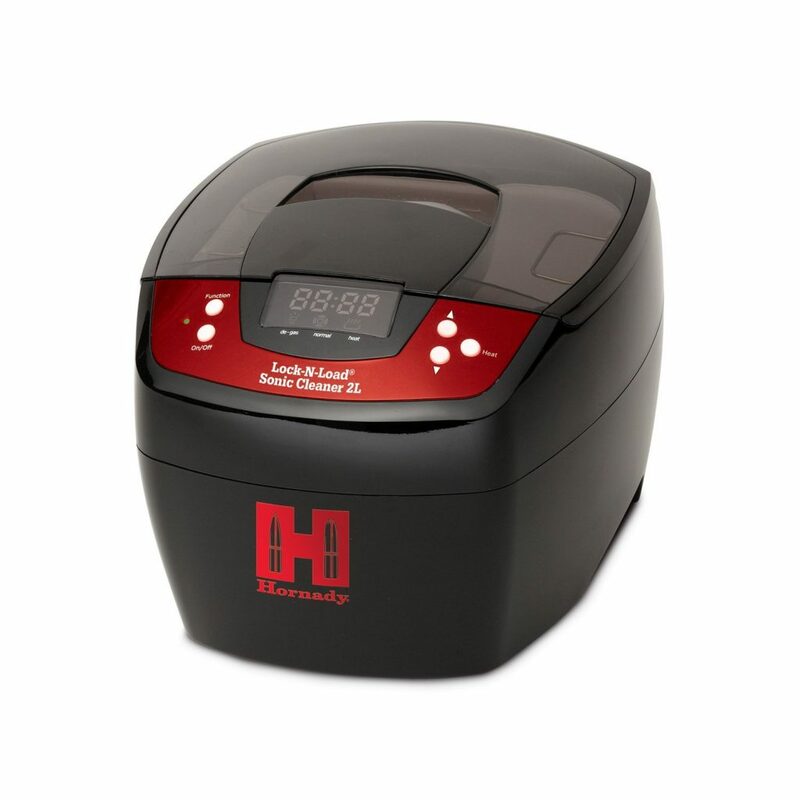 In the other corner, wearing the black and red casing, weighing in at 6.6 pounds and 2 liters of cleaning solution is the Hornady Lock-N-Load Sonic Cleaner ($80)! The Harbor Freight cleaner has two buttons: on and off. Pressing the on button starts a 3 minute cycle. It also has an LED light that illuminated the solution and makes it easier to see what’s going on. The Hornady Cleaner has a ceramic heater that can bring the water up to 135℉ and the heater is controlled by an on/off button. It has an adjustable timer that can be set between 5 and 30 minutes. Finally, it has a function that will clear any trapped bubbles in the liquid. Large, existing bubbles can affect cleaning so it’s a good idea to pop them first before initiating microbubble nuclear holocaust mode. Round 1 Winner: Hornady Cleaner! No surprise here, really. It’s a $30 device versus an $80 device. The Hornady is bound to have more features. I do wish the Hornady had an LED light in it as well, mind you. That would have made round one a very decisive victory. Round 2: Pros and Cons. Fight! I’ve mentioned it a couple of times but that 3 minute timer on the Harbor Freight cleaner is really annoying if you have to do more than 1 cycle. Lack of a heater also makes me feel like I’m missing out on some cleaning power. Its tiny size means you can put it just about anywhere and it won’t be in the way. At the same time, it doesn’t take much liquid to fill up at all so your bottle of cleaning solution will last longer. Unfortunately, that tiny size is also going to restrict you on what you can clean with it. You’re going to be restricted to jewelry and smaller individual gun parts. The Hornady cleaner, on the hand, can handle pretty much anything you can throw at it. Want to clean some casings? This will clean about 300 .223 brass at once. Gun? Wash all your slides at the same time! Need the acrylic stripped from your Space Marine Dreadnought model because you messed up the painting? Toss that thing in! Heck, throw the airbrush in at the same time! Turn on the heater for some extra beef in the cleaning. It’s not all rainbows and lollipops, however. First off, the heater causes massive levels of condensation to collect on the lid. There is no way to lift that lid off without dripping that condensation over everything. Fortunately, the condensation is just plain water so you don’t have to worry about your countertop or workbench’s finish. Still, it makes a mess. Secondly, it’s not a tiny device. At 8x8x10 inches, it’s going to take up some real estate. Also, with a 2 Liter tub, it takes a bit of liquid to fill it up. Now, you don’t have to fill it all the way unless you need to but the minimum fill line takes the same amount of liquid as the max fill line of the Harbor Freight cleaner (1 pint). It’s a hungry cleaner and will drink your milkshake cleaning solution fast. According to Hornady, depending on what and how often you clean, you can get a few cleanings out of one tub of fluid. It’s not recommended to store the liquid in the cleaner, however. Winner: Close but still Hornady! I know it’s hard to believe but this was a much closer match than round 1. They both have their pros and cons and it really comes down to what you’re ultimately looking to do with the cleaner. Round 3: How Does it Clean? Fight! First, I have to apologize for the lack of before and after pictures here. The memory card in my camera got corrupted and all the photos I took during testing were lost. I’ll do my best to describe the outcomes. Casings – Yeah, the Harbor Freight cleaner didn’t do much. The Hornady cleaner, on the other hand, did a good job. I mean, I should hope so because brass cleaning is what they market it with. It should be noted that it still wasn’t as shiny as the brass that comes out of my steel media tumbler. It’s clean enough for most people but I like my brass to look like C-3PO. Still, good enough with less work than my tumbling so if I was in a hurry I’d totally use this method. It’s not really a surprise that the Hornady won. As I said in round, this isn’t really an apples to apples comparison. 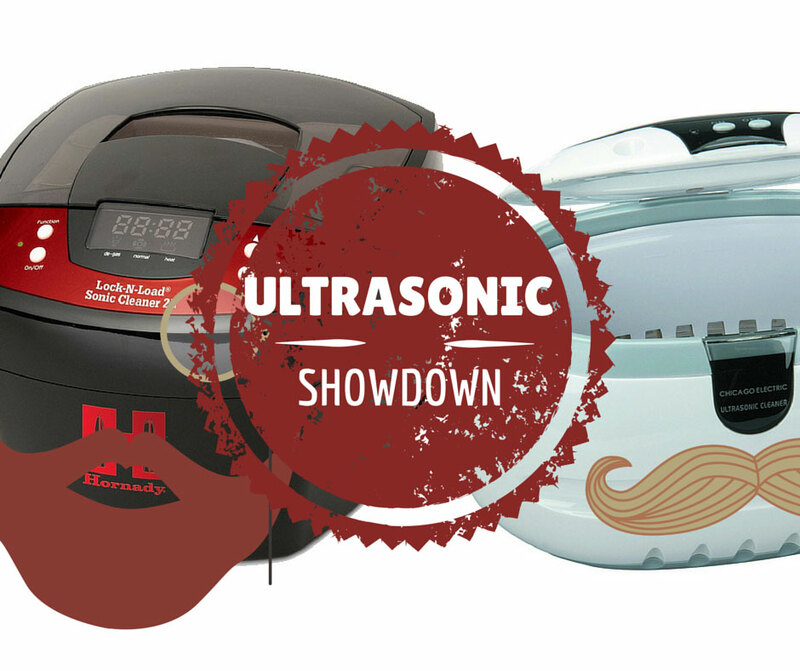 Yes, they’re both ultrasonic cleaners but it really comes down to what they were intended to clean. If you want to get a cheap cleaner to test how it would work for you, then the Harbor Freight is a great choice. Admittedly, it’s why I bought mine in the first place. Now, Harbor Freight does make a 2 liter cleaner but, at its price, it isn’t much more money to get the Hornady cleaner instead. Keep in mind, just because the Hornady won this fight doesn’t mean the Harbor Freight cleaners are bad. There are very strong opinions about the longevity of Harbor Freight tools. I haven’t personally had any problems with any of their stuff but your mileage may vary. Either way, there are ultrasonic cleaners available for every budget and their usefulness makes them well worth the money. You won’t regret it! Good article but I didn’t see it posted where both cleaners volumes were stated. I’m looking for something to clean my handguns. I don’t reload anymore so no need for cleaning cases. We (my FFL business) bought the large Lyman $1200 ultrasonic cleaner and a separate tank that uses their lube so we can offer cleaning and lubing of even large firearm parts and items to our customers. Works great! 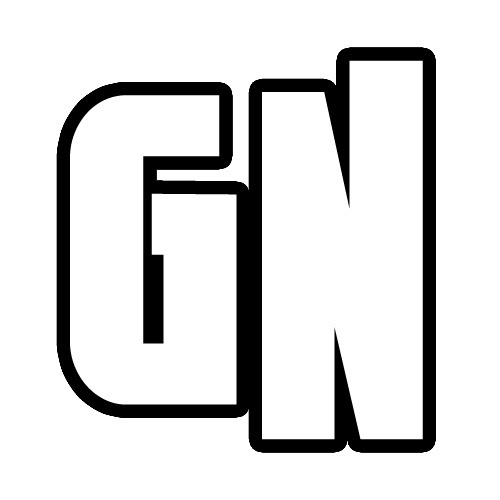 Hi Chase, great comments and recommendations for making our articles better!